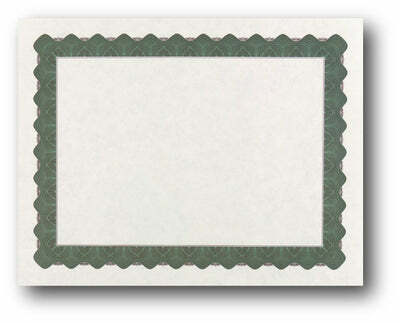 This certificate features a beautiful green border on a parchment background. It measures 8 1/2" x 11" and is created for use in both inkjet and laser printers. The writing space inside the certificate measures 5 7/8" x 8 3/8". Our blank certificates are made from 24 lb bond (90 GSM) paper.